From Co. Armah, Ireland to Gettysburg, Pennsylvania! Originally from Co. Armah, Northern Ireland, Joanne and Kevin McCready immigrated to the United States in 1993 where they settled in the New York City area. While Joanne worked in the financial industry for a bank, Kevin worked as a carpenter, focusing on high-end finish woodworking. In the fall of 2006 while visiting friends in Gettysburg, they found that Hamilton’s Tavern was for sale. Having always wanted to go into business for themselves, the McCreadys renamed the bar the Garryowen Irish Pub on June 1, 2007 and the rest is history. Over the next couple of months Joanna and Kevin began to remodel the bar, giving it a more authentic Irish look and feel, modeling it on the pubs they loved back in Ireland. Keeping with the authentic feel, the McCreadys began using many of the dishes from Joanne’s family. These included Shepherds Pie, Fish and Chips, the Ulster Fry and more. Over the years, the Garryowen has made it a point to partner with Adams County businesses to ensure the best quality produce, meats, and beverages accompany what they have to offer to customers. As business continued to grow, so did the need for more space. Recently, an additional dining room named the Gosford, as well as another bar, the Scullery were added to the Garryowen. They also added a new kitchen, allowing the flexibility to expand the menu. 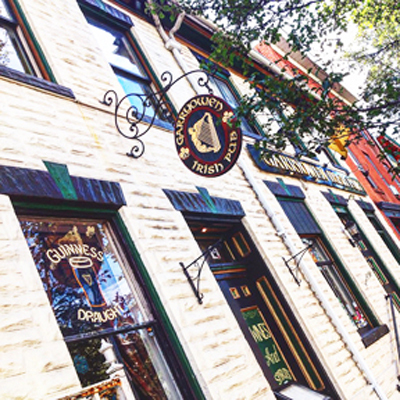 In addition to the authentic food and atmosphere, the Garryowen also boasts one of the most extensive Irish whiskey collections in central Pennsylvania. The Garryowen first and foremost remains a place of community steeped in the flavor and culture of the pubs “back home.” Keeping with this tradition, the McCreadys love to give back to the community and people who support their business. Some of their favorite charities include the Gettysburg Community Soup Kitchen, the local SPCA, the Gettysburg area School District, Penn State’s THON, and many more. Be sure to stop by the Garryowen the next time you visit Gettysburg. Every weekend features live music, everything from indie to funk and from classic honky-tonk to punk. Enjoy authentic Celtic tunes every first and third Sundays of the month as the Garryowen plays host to the traditional Irish Seisiun from 2-5 PM!